The normalization of relations between Turkey and Germany is already a reality. The military honors with which Turkish President Recep Tayyip Erdogan was greeted today by his German colleague Frank-Walter Steinmeier is only one of the signs of this phenomenon. Chancellor Angela Merkel, judging by their joint press conference, managed to find common ground with the Turkish president, who two months ago accused her of "fascism." Merkel began with the main thing that binds the two countries - the economy. "Germany is interested in economically stable Turkey," she said. Under the pressure of US sanctions in Turkey, the financial crisis began, the lyre fell by 40%, inflation is growing. Ankara needs help. Germany is not yet in a hurry with direct lending, but will intensify trade relations with its partner in NATO. Merkel said that in the near future the German Economy Minister Peter Altmeier will go to Turkey, where the first meeting of the joint economic commission and the bilateral energy forum will be held. Along with the economy, refugees are another topic that forces the parties to move closer. Merkel highly appreciated Ankara's contribution to the fight against the migration crisis. Turkey not only hosted more than 3 million refugees from Syria, but also by agreement with the EU blocked new migration waves to Germany, in fact rescuing Merkel's chancellor. In addition, the deal between Erdogan and Vladimir Putin on the Syrian province of Idlib prevented the threat of a new refugee crisis in the Old World. One of the most important agreements on the results of today's meeting in Berlin can be considered Merkel's statement on holding the "summit of four" in Syria in October with the participation of the leaders of Russia, Turkey, France and Germany. This meeting, which was planned to be held in Istanbul in the early days of September, fell through the threat of the Syrian army's attack on Idlib. But now with the achievement of an armistice in this province all conditions for coordination between the EU, Russia and Turkey have appeared. Putin and Erdogan expect to attract European money for the restoration of Syria. The "summit of four", if held, will be a serious step to weaken the US influence in Syria. As for the US, Erdogan called on Merkel to jointly fight American protectionism, which is "a great threat to global security." Earlier, Trump increased duties on goods from a number of countries, including the EU and Turkey. Today, the Turkish president also spoke about the incident that occurred at the July NATO summit. When Trump was indignant that Europe paid dearly for gas from Russia, Erdogan intervened and said: "We receive 50% of our natural gas from Russia, and if we do not buy it, our citizens will freeze in winter." So, inspired by Erdogan's boldness, Merkel almost repeated his words at the NATO meeting. Human rights and freedom of speech in Turkey remain the main stumbling block in bilateral relations. German journalists tortured Merkel and Erdogan for a long time with questions about German journalists arrested in Turkey. The Chancellor reported a gradual progress in this matter, and Erdogan asked the Germans not to stick their nose in the Turkish justice and recalled them about the German members of the Kurdish separatists and the group of Fethullah Gülen, the author of the coup attempt in Turkey. The culmination of the press conference was an episode when a journalist in a T-shirt with the inscription "Freedom for journalists" tried to disrupt the meeting. But that was safely put out the door. Then the correspondent of the German DPA agency took up the case, also tried to arrange a provocation, but more delicately, with the help of the question. 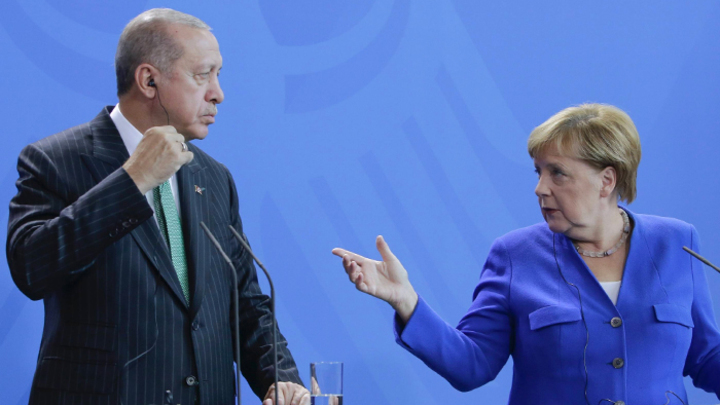 He asked Merkel why she did not invite to the briefing Turkish journalist Jan Dundar, who is hiding in Germany and accused Turkey of delivering weapons to ISIS. Was it in order not to offend Erdogan? To which Merkel objected that Dundar himself had made such a decision. To the Turkish president, the DPA Journalist asked even sharper questions: "Have you apologized to Merkel for accusations of Nazism?" And "How disappointed are you that the European Football Championship will not be held in Turkey?" Erdogan ignored both questions. Erdogan, apparently, got what he was driving for. Judging by Merkel's statements, Germany is ready to support Turkey economically. Berlin will help Ankara overcome the crisis, as it directly relates to its interests. Mainly because of the refugees and because of German capital and investments in Turkey. For its part, Germany received guarantees that Turkey will continue to deter refugees. We can also consider the agreement reached to hold a summit in the Russia-Turkey-France-Germany format as a great progress.